Putin Spokesman says Russian Ambassador met with the Clinton Campaign Team Too! If the Russians are right, and the ambassador met with Hillary Clinton’s people too… then what is the problem with the Trump team meeting with them? 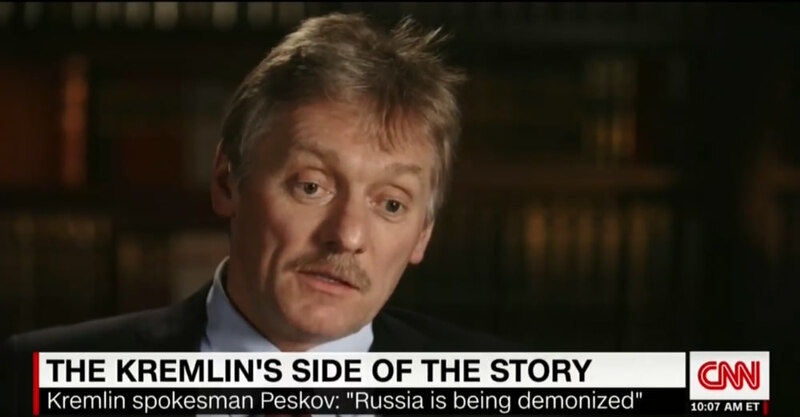 CNN’s Fareed “the Plagiarist” Zakaria sat down with Vladimir Putin’s Press Secretary, Dmitry Peskov, over the weekend to have a frank discussion about Russia’s recent role in our nation’s politics. Of course the Russian spokesman denied that his nation had any direct impact on our recent election, and feigned indignation at the very idea that Russia would be accused of doing anything underhanded. Zakaria: Let me ask you very directly, did the Russian government have any collaboration or serious communication back and forth with Donald Trump’s campaign during the election campaign last year? Peskov: The answer is very simple. No. The fact that Russia is being demonized in that sense comes very strange to us. We are really sorry about that. The whole situation takes us away from the perspective of getting our relationship to a better condition. We quite unexpectedly we were faced a situation when Russia, all of a sudden became a nightmare for the United States. We cannot sincerely understand why American people and American politicians started the process of self-humiliation. You’re self-humiliating yourself saying a country can intervene in your election process. However, the most important point from the conversation came when Zakaria asked if the Russian ambassador had any meetings with Hillary Clinton’s campaign. Peskov answered that of course the ambassador meet with Clinton’s people, because THAT’S HIS JOB! Zakaria: So what was it that the Russian ambassador was talking to so many of Donald Trump’s associates about? Peskov: This is his job. He was talking about bilateral relations. He was talking about what is going on in the United States so we have a better understanding in Moscow. This is what is being performed by every ambassador of Russia abroad. Every ambassador of the united States abroad, including in Moscow. The more ambassador talks to people in his country of residence, the better job he does. Zakaria: Did he have similar meetings with Clinton campaign officials because I don’t know of any? Peskov: Well, if you look at some people connected with Hillary Clinton during her campaign, you would probably see that he had lots of meetings of that kind. There were no meetings about electoral process. No way it should be perceived as interference. If you look at it with intention, you would probably say he was trying to interfere in Hillary’s activities. It would be nonsense because it’s not true. CNN’s Zakaria needled Peskov into admitting that Putin preferred Trump to Hillary Clinton in the 2016 election. Peskov again affirmed that this was the case, but it was due to Hillary Clinton’s aggressively anti-Russia rhetoric. The spokesman also told Zakaria that Putin and the Russian government DID NOT interfere with the election in any way, shape, or form. Zakaria: Isn’t it fair to say that Mr. Putin did not warm to Hillary Clinton and he accused her of meddling in Russia’s internal affairs during the 2011-2012 campaign for his own presidency. It does seem as though he might have had a preference for Mr. Trump because in his view Hillary Clinton tried to interfere in Russian politics. Peskov: You would probably recall that president Putin during election campaign never answered direct question about his candidate of his support. He kept saying that we will respect the choice of American people and only American people can and should choose their own president. These were the words of president Putin that he had repeated numerous times during this last couple of years. Of course, if you ask him whether he mentioned the then candidate Donald Trump, I will answer yes, he had. Why? The candidate Hillary Clinton was quite negative about our country and her attitude declaring Russia nearly the main evil in the world and the main threat for the United States. To the contrary, the other candidate, Donald Trump was saying that yes, we disagree with the Russians in lots of issues but we have to talk to the in order to try to find some understanding. Whom do you like better? The one that says that Russia is evil or the one who says we disagree but let’s talk, to understand and to try to find some points of agreement. Of course, public opinion will likely be the other one. It’s quite natural. It’s quite natural. But it doesn’t mean in no way that Russia has interfered in the electoral process. I wonder if the media will report on this blockbuster interview or if like everything else that doesn’t fit their narrative they’ll just ignore it? Interview transcript from the Lid.